Rain, India submitted to the assignment ‘After the Rain’ on National Geographic. Kristian Bertel has contributed to the National Geographic Your Shot photo community with an assignment called ‘After the Rain‘. Curated by Marie McGrory an assistant photo editor at National Geographic wants us to photograph rain. One of her favorite times for making photographs is just as the rain stops and like in a magical movie moment when a bright beam of sunlight breaks through a heavy sky, light reflects off of streets and the whole world seems to glisten. But rain gets a pretty bad rap and a rain forecast is often met with grunts and sighs. This assignment is looking to change that. She hopes that by the end of it you will not be able to wait for the next rainfall. This assignment is simple and straightforward, with lots of room to get creative. She believes photography can help us find the moments, feelings and stories that transcend cultural boundaries. As Marie is saying it: ”- Find the woman who got caught without an umbrella or the man stomping in puddles. Find the flowers the rain brings to life and the trees a storm breaks apart. Look for reflective wet surfaces and bright new colors. Rain is all about mood. I want to be able to smell the rain in the air and feel your damp socks as I look through your photographs”, she says. 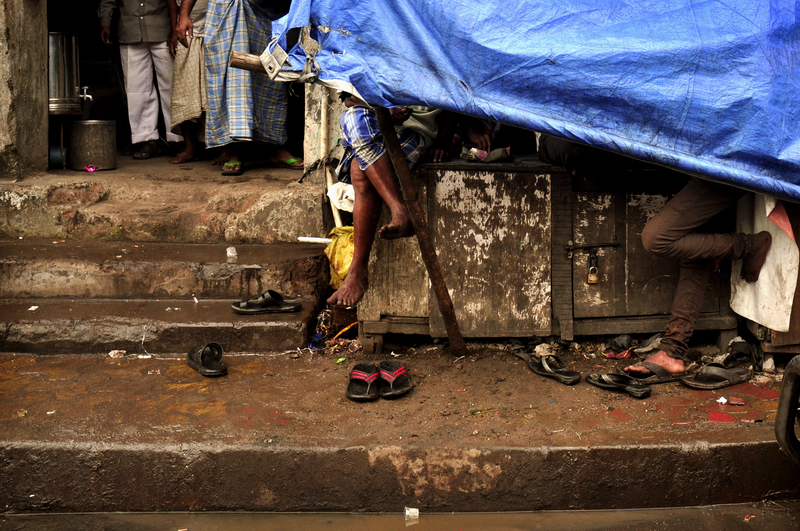 The photographer chose to submit a photograph of some feet and sandals during a day with rain in Mumbai, India. Rain can bring joy, as some consider it to be soothing or enjoy the aesthetic appeal of it. In dry places, such as India, or during periods of drought, rain lifts people’s moods. The photo submitted was taken during normal rain and not during the monsoon, which is known in India. Yet it is only partly understood and notoriously difficult to predict. Several theories have been proposed to explain the origin, process, strength, variability, distribution and general vagaries of the monsoon, but understanding and predictability are still evolving. Monsoons typically occur in tropical areas. One area that monsoons impact greatly is India. In India monsoons create an entire season in which the winds reverse completely. Various atmospheric conditions influence the monsoon winds. The first condition is the differential heating and cooling of land and water. This creates low pressure on the landmass, while high pressure is created over the seas around during day time, but is reversed during the night time. ”- I was fascinated of the line up of the legs, feet and sandals in this travel and weather photograph, it was a moment depicting rain in many ways”, the photographer Kristian Bertel says.